I have a 2015 Felt Z75 road bike that I just bought used and have noticed a clicking/cranking noise under heavy power, and only when on the smaller gears on the cassette. So with the front derailleur on the large gear and just for like the last 4 smallest gears on the rear derailleur it makes a clicking/cranking noise when pedaling and only under heavy power. For the bigger gears it doesn't make any noise. Everything seems to shift well on the stand and while riding. Any idea what would be the source of this noise? Each revolution has several clicks in the cranking noise so I imagine it is for each gear that is rubbing or something, but no idea. It is an 11 speed 105 derailleur. Other than the noise it seems to ride great. Chain rubbing on front DR cage? Rear DR not adjusted correctly and chain trying to shift to another cog but doesn't quite. Wrong chain. Bent rear DR hanger. Probably other things. As well a low tolerance of owner for noise. Take it to a shop if you aren't completely familiar with adjusting such stuff. An incomplete understanding of adjustment might fix your immediate issue, but cause other issues immediately or later. First thing is to use common terms as others do to avoid confusion. The bigger gears to experienced riders mean harder to pedal/greater ratios/downhill/faster riding gears. The larger cogs are the easier/lower ratios/uphill ones. I assume that you are talking about the smaller rear cogs which result in a greater ratio. Noises when pedaling hard can come from a few different sources. The first is common chain/cog wear, the smaller the cog is the greater the wear rate is. The second is issues with the BB. Both have been covered on this forum to no end before. Other less common causes can be poor adjustments, chain link problems, cog tooth issues, bent parts. Noise under power is often indicative of lube, wear, bearing fit issues. As example the now common pressed in BB bearing designs are well known for having enough slop in their "press fits" to allow some slight movement between the bearing and shell or axle. This movement can cause clicks/creaks and such. Under power this movement is more likely, using higher ratios usually involves more power being applied. On a stand there is almost no power needed to spin the drivetrain. This type of noise is usually periodic with the pedal/crank rotational position. We do a lot of BB R&Rs (remove and reinstall) on these bikes when the actual bearings are still spinning nicely but their interfacing with the rest of the bike isn't good. There are a number of aftermarket Bb shell inserts which offer a change to how the bearings/shell assembly is done and therefore a change to the noise potential. So I brought the bike into a local shot to get fixed. After a few days they said it was fixed so I picked it up and while they didn't charge much and fixed a noise from the front of the bike, this noise remains. Sounded like they went through and lubed up everything they could think of. Maybe they test rode it in the larger cogs and though it was fixed, as only makes the noise when using the smaller cogs on the rear cassette. Something new I have noticed is that it makes the noise only under heavy power from my right leg. So if I put most my power on my left leg I can't make the noise. But under heavy power from my right leg it makes the noise with every rotation of the crank. Open up your QR skewers and spray some silicone lube on the cams and such, took m a long time to figure this out! I had a similar issue and it stemmed to when I fell off my bike, I'd threaded the pedal on the bottom bracket as it hit the tarmac. It would creak under heavy load. To fix I took the bottom bracket out completely, cleaned and put back together again. May be worth a look if it only occurs under pressure. One thing though, I could 'feel' the creak as I pushed through on the pedal. I'll second the first thing the first response suggested: Check the adjustment of the front derailer. 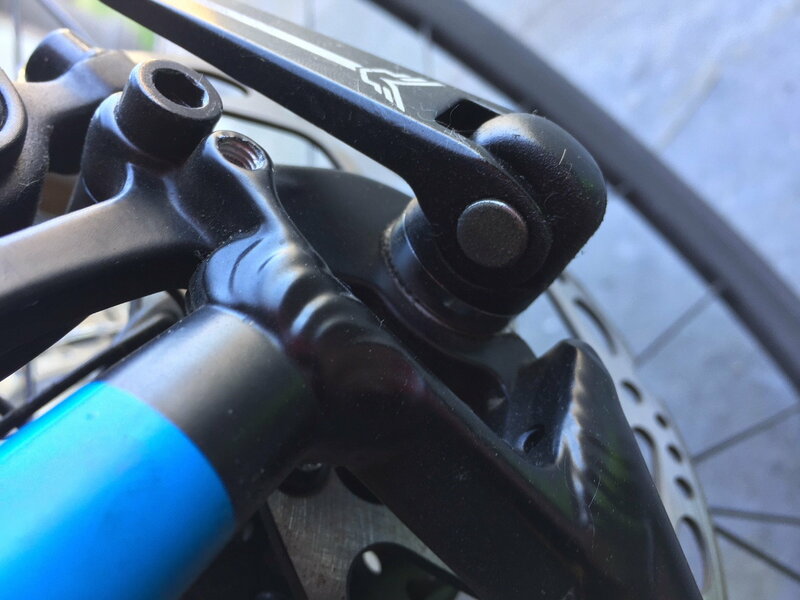 If it is a little too close, it may cause a chain-rattling noise against the fr der cage under heavy pedaling (when the frame can flex) but not in the work stand. Maybe back off the fr der's High limit screw a quarter turn or so. Thanks for the suggestion. This reminds me that after I changed the tires the sound seemed worse. They got it back to better at the shop. This is a picture of my skewer. I believe the cam is the part that contacts the frame? Should I be lubricating between the cam and the part with the quick release handle? Should I lube between the frame and the cam? Take it back to the shop if they didn't fix what you needed fixing. There are hundreds of things that can creak on a bike. If you are riding in a serene, peaceful and very quiet area, you might be focusing too much on normal noise that is no issue. Clicks might be the chain trying to start a shift to another cog. Might just need to turn the barrel adjuster screw for the DR or on the in-line adjuster is so equipped a quarter to half a turn. Might also be a ever so slightly bent hangar. Might be the wrong chain for the bike. Might be chain is worn and/or sprockets worn. Might be somewhere else, like in your pedals. Though when my pedals clicked, it was only once per revolution. I will probably have to do that eventually. They had the bike for 3 days last time, and just hate to lose on riding when the weather is nice. 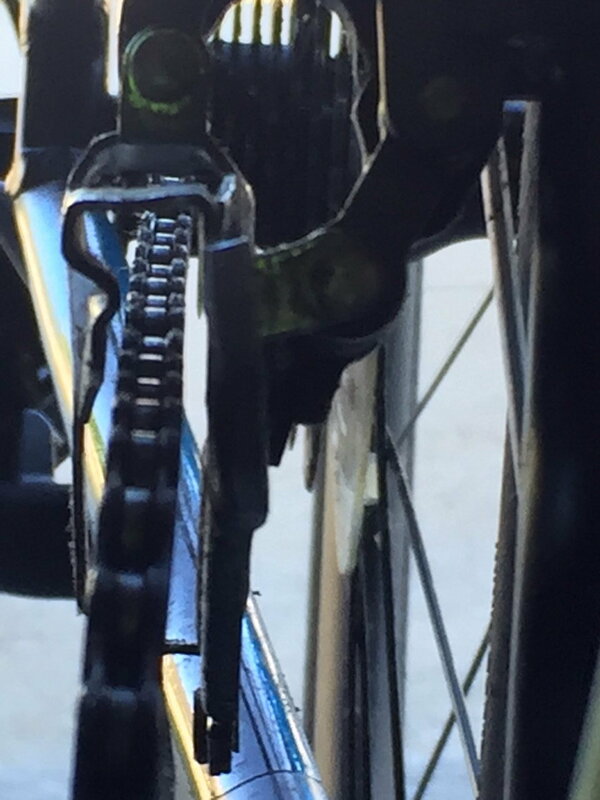 It does sort of sound like it could be links hitting as it is a clicking sort of noise, but it looks like there is a lot of clearance in the derailleur. As for the previous pic showing the DR clearance. Remember you said this is when you are putting it under heavy power. The frame might twist and flex enough to make that clearance disappear. Okay, the third look at the pic was a charm.... now I understand what I'm seeing. Don't know what to make of it though other than you do have clearance when everything is static. Last edited by Iride01; 07-08-18 at 11:47 AM. Yes the pic is kinda funny. It makes the sound without all that much power, how the frame doesn't flex that much. I think I trimmed it out a bit with the shifter and the noise didn't seem to changed. I'll stil try to give it an adjustment. Can this all be the bottom bracket? There isn't any play in the crank, but still makes me wonder. I'm not really sure what the symptoms are of a bottom bracket that is going bad. It could be tons of stuff, and if you aren't used to looking for the causes of various noises on bikes you can end up spending a lot of time fixing stuff that isn't broken. I have an identical problem and, upon further inspection, I figured out that it was due to the chainring having a bit of wobble which gets excerbated when I pedal hard. Change big chainring, cassette range, or?